Nova Scotia, keenly aware of tourism’s importance to the provincial economy, is sprucing up Peggy’s Cove, the Cabot Trail and other iconic sites. Business Minister Geoff MacLellan says a new $6-million infrastructure program aims to revitalize five tourist hubs and improve the visitor experience. MacLellan said the impetus for the Tourism Revitalization of Icons Program comes from the province’s lofty goal of reaching $4 billion in tourism revenues by 2024. 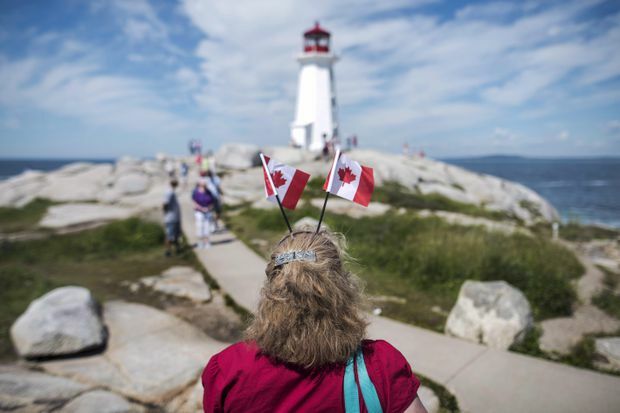 Nicole Freeman, of Montreal, wears two Canadian flags in her hair while visiting the lighthouse at Peggy's Cove, N.S., on Canada Day, July 1, 2016. Five iconic tourism sites in Nova Scotia including Peggy's Cove and the Cabot trail are getting a total of $6-million over three years for tourism infrastructure projects. The Tourism Department estimates visitors spent $2.7 billion in the province in 2017. Peggy’s Cove is to get $2 million, while the Halifax waterfront is to receive $1.5 million and the Cabot Trail $1 million. The Bay of Fundy, including Annapolis Royal, and the Lunenburg waterfront are to each receive $750,000. The program will be administered by Tourism Nova Scotia, which is to begin working with partners to identify the best plan for each site. Develop Nova Scotia will lead the planning and implementation of enhancements at Peggy’s Cove, which will include consultation with community and business groups. MacLellan said the government sees tourism as one of the pillars of the province’s economy. He said the sector, which employs around five per cent of the province’s population, has seen steady growth over the last four years. The minister said although the province has a general idea how the money will be used to bolster infrastructure needs, specifics will be released once individual projects are finalized. McLellan said additional program partners and projects will be announced once they are confirmed, adding that it’s likely the funding program will have a life beyond its current three-year mandate. Earlier this year the Tourism Department released figures indicating a record number of tourists came to the province last year. It said 2.4 million people visited Nova Scotia in 2017, an increase of nine per cent over the previous year. Visitation by road was up seven per cent, while visitation by air increased 13 per cent.